The artists at Vista Studios are pleased to welcome painter Michel McNinch. Michel is subletting one of the studios for the next six months and will be exhibiting work with the group for the upcoming Vista Lights celebration. 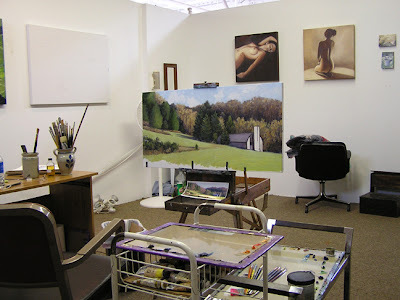 She has already set up her easel and materials, is hard at work, and using her new space regularly. (See photo above.) Below is her picture and links to her website and blog. To visit Gallery 80808/Vista Studios website, click here!